KABUL - Afghanistan's national airline could be days from collapse due to corruption, mismanagement and a crippling airplane lease that has drowned the struggling airline in debt. The government is scrambling to court investors to privatize up to 75 percent of state-owned Ariana Afghan Airlines, and is tallying its assets in case the company is liquidated, an Associated Press investigation has learned. 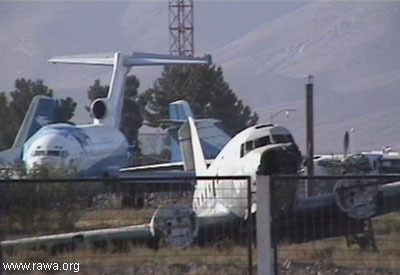 The collapse of the 52-year old airline, which survived the Taliban regime despite international sanctions, would be a potent symbol of failure by the administration of President Hamid Karzai and would reinforce growing perceptions of corruption and incompetence. "If Ariana collapses, it will be a very heavy blow for people's trust in government," said Ziauddin Zia, deputy commerce minister. Afghanistan would lose 50 percent of its international flight capacity. Ariana is blacklisted from flying to European Union countries because of safety concerns; it mostly flies to the United Arab Emirates, India, and Turkey. U.S. Embassy and United Nations employees are also banned from flying the airline due to safety concerns. Ariana's former maintenance director told The Associated Press that the airline's safety department issues licenses and certifications to mechanics and pilots in exchange for $200 to $500 bribes. Yousuf Sultani, who left his post in February and now lives in the United States, also said Ariana has 500 people on its maintenance department payroll but that only 30 work. Afghanistan's Transportation Minister, Niamatullah Ehsan Jawid, acknowledged the airline is beset by corruption that prevents it from turning a profit. Ariana employs some 1,800 people but operates only seven planes. Among the estimated $14 million in immediate debts Ariana owes is a $1.9 million bill to Chicago-based Boeing Co. for two leased 757s, which must be paid by Saturday. Ariana also owes some $7 million to its Afghan fuel supplier, which could turn off the pumps any day. "If they are patient we can continue, if they are not we will have to stop (flying) tomorrow," said Abdul Rahman Sultani, Ariana's vice president of finance. "Either the Afghan government helps us or we stop our service." Ariana owes $41 million overall, Sultani said. It earned $3 million profit last year on an estimated $74 million in revenue. It lost $25 million the year before. Ariana's acting president _ Engineer Raz Mohammad Alami, named last week after Ariana lost its second president in six months _ hopes the U.S. will intervene and ask Boeing for leniency, though Boeing has already pushed back the due dates on some of the debts Ariana owes. "My message for Boeing is that they are aware that the international community is helping Afghanistan and Boeing knows that there was 25 years of war in this country," said Alami, also the deputy transportation minister. "We have been very lenient, and we will continue to do everything we can to help Ariana, just like we do all our customers," said Brian Walker, Boeing's communications director for the Middle East and Africa. He did not elaborate. Since the fall of the Taliban regime, Ariana has received considerable foreign support. India donated Airbus jetliners to help the airline recover from the U.S.-led invasion, when six jetliners sitting on runways were bombed. But Kabul's debilitated airport still can't provide satisfactory security checks, Jawid said. "You can give a border police officer $50 and you can transport anything" on a flight, Jawid said. Flight schedules are erratic, flight attendants typically don't conduct preflight seat-belt checks, and a pilgrimage flight to Mecca that Ariana chartered on a Boeing 747 this year carried 640 people _ some 25 percent over maximum capacity, according to a company publication. But it was the leased Boeing 757s _ which Ariana was never able to use as it wanted _ that could cause financial ruin. The planes, contracted in 2005, couldn't be delivered for over a year because of leasing agreements and security requirements, said Abdul Ahad Mansoori, Ariana's former president. As the planes sat idle in London and Paris last year, Ariana was accruing about $1.1 million in monthly debt for the lease, parking, maintenance and flight crews, said Sultani, Ariana's vice president of finance. Boeing would not allow the planes to be based in Afghanistan, so Ariana hired France-based Eagle Aviation to register and operate the planes out of Paris, said Mansoori. Eagle would not allow its flight crew to be based in Kabul, so they were instead based in Dubai, meaning Ariana was paying for expensive plane parking and hotels for the crew, he said. Eagle earlier this month stopped flying routes for Ariana, saying it hadn't been paid $3 million it was owed, Mansoori said. Afghanistan's attorney general's office is investigating whether any Afghan officials improperly benefited from the contracts. Deputy Attorney General Mohammad Aloko said the office hadn't named any suspects, but Transportation Minister Jawid and other officials question whether former Ariana President Mohammad Nader Atash profited from the deal. "I worked with integrity and honesty," Atash said of his tenure between May 2005 and fall of 2006. Atash, a university professor and researcher and with no experience in the airline industry before his appointment, alleged that a high-level government mafia wants Ariana to fail so officials can start _ and profit from _ their own airline. He declined to name the officials, saying to do so could put him in danger. "They thought that if Ariana is not there it's open season for themselves," Atash said by phone from his home in Virginia. Jawid said he would let 75 percent of Ariana be privatized if an outside investor wanted to take over the company. He said he planned to meet with executives from Dubai-based Emirates airline next week. Other investors are said to have expressed interest but no firm offers have been made. Jawid is also contemplating another proposal. He plans to ask U.S. Ambassador Ronald Neumann next week if the U.S. could help with the Boeing contracts in exchange for the value of the planes bombed by the U.S. military during the invasion in 2001. The U.S. Embassy said it wouldn't comment until it saw the specifics of any such request. At least Ariana's Afghan-based fuel supplier, which is owed some $7 million, appears ready to grant the airline more leeway. Abdul Ghafar Dawi of the supplier Dawi Group said he will continue to give Ariana the 60 to 80 tons of fuel it uses every day. "Ariana is the dignity of Afghanistan," Dawi said. "All my friends say it will collapse, but I love Ariana."